He knows the conversations will never be easy, but he never shies away from them. Whether it’s a short chat, a longer talk or simply to listen, the 28-year-old pro hockey player is engaged every time. It’s easy to understand why he is. Hayes, whose brother Kevin plays for the New York Rangers, was in Grade 5 when his mother, Shelagh, was told she had colon cancer. He had just started his NHL career when he found out his father, Kevin Sr., was diagnosed with throat cancer. "Twice my family faced cancer, and twice we got through it,” said Kevin Hayes in his MSG blog last November. “I am grateful now to have a platform to inspire others every chance I get – sharing my experience with children and others dealing with cancer." It’s equally important to Jimmy. That’s exactly what Hayes saw in his former New Jersey Devils teammate Brian Boyle. The 33-year-old forward is a cancer survivor himself. 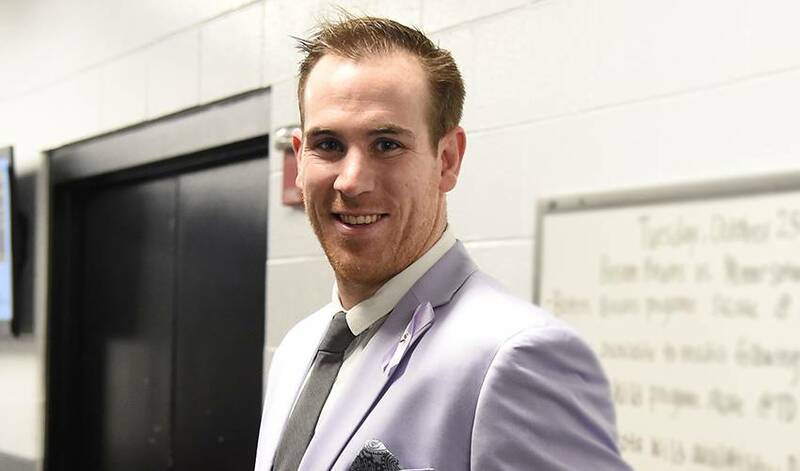 Diagnosed with chronic myeloid leukemia on Sept. 19, 2017 after a blood test during a training camp physical showed abnormal results, Boyle received treatment and was back on the ice last November. He was also the recipient of the League’s Masterton Trophy (best exemplifying qualities of perseverance, sportsmanship and dedication to hockey). This October, he announced his cancer is in remission. On November 5, Boyle netted his first NHL hat trick. Fittingly, it came on Hockey Fights Cancer night in Pittsburgh. I fight for @BriBrows22 and my godmother Pauline. It gives Hayes three impactful stories to share with people who are dealing with cancer, especially during Hockey Fights Cancer month in November. And it also reminds him of his continuing advocacy for early detection. Currently, Hayes is playing with Pittsburgh’s American Hockey League affiliate in Wilkes-Barre/Scranton, who have also partnered with the Hockey Fights Cancer initiative. Hayes remains committed to those affected by cancer.